Apparent 'Price Tag' vandalism in Arab towns in Samaria with damage to cars and graffiti demanding end to demolitions of Jewish outposts. Vandals targeted two Arab villages in Samaria early Tuesday morning, damaging residents’ cars and spray painting on walls in an apparent ‘Price Tag’ incident. Cars in the Arab villages of As-Sawiya and Luban a-Sharkiya in Samaria were hit in the predawn ‘Price Tag’ incidents, with tires slashed on a number of vehicles. 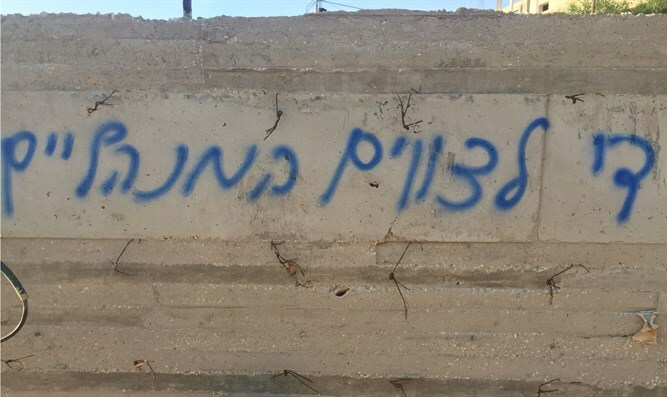 In addition, residents found graffiti on several walls in the villages, with messages apparently referencing either recent Civil Administration demolitions of Jewish outposts in Samaria or administrative orders distancing local activists from Judea and Samaria. The vandals also spray painted messages calling to ‘expel or kill’ – with no clear indication who precisely the vandals were referring to. “No more administrative orders”, read one spray painted message, while another read “Price Tag”, and a third “Expel or kill”. In recent years, evacuations of hilltop outpost communities and attacks by local Arabs on Jews in Judea and Samaria have prompted a string of vandalisms dubbed “price tag attacks”. The vandals have used the term “price tag” to frame their actions as a deterrent to Arab assailants and stone throwers, as well as Civil Administration officials planning to demolish Israeli-owned properties in Judea and Samaria. Last week, the Saada Mosque in the village of Aqraba [Akraba] in Samaria was targeted by vandals who attempted to set the front door on fire, and spray painted the words “Revenge” and “Price Tag” on exterior walls of the mosque.